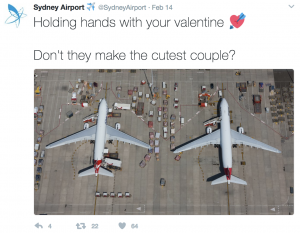 Some airlines and airports went all out celebrating Valentine’s Day this year, while others kept it short and sweet. Heartfelt stories from travellers naturally performed well and passengers were smitten for those that dished out free chocolates. I particularly like Virgin America’s combination of social awareness and a Spotify playlist created for singles wanting to escape the bombardment of love. A perfect fit for the airline. Emirates rose livery aircraft (pictured above) and its story is perhaps the grandest of them all. So, in no particular order, let’s see who did what in 2017. Southwest Airlines attached Southwest teddy bears to passengers’ luggage to surprise them at the baggage carousel after flights. Southwest said that this was just one way that shows the true Southwest ‘heart’. 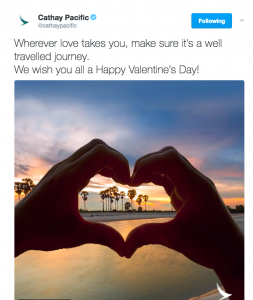 Air New Zealand reached out on social for stories of love and ‘#goingthedistance’ 2 weeks before Valentine’s Day. Then on the day they shared a video telling a remarkable story of friendship and love between Joanna from Christchurch and her best friend Vanessa from Manchester, UK. Their friendship story began on Valentine’s Day 1996 and Air New Zealand helped the two reunite as part of their #gothedistance campaign. Great story telling as always from the team at Air New Zealand. 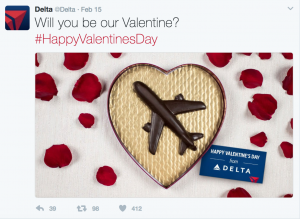 Virgin Atlantic posted a quirky video to partner Delta Airlines on Twitter, asking them to be their Valentine. The video highlighted the ‘great’ things about their trans-atlantic relationship but I’m not sure it will pull many heartstrings with customers. 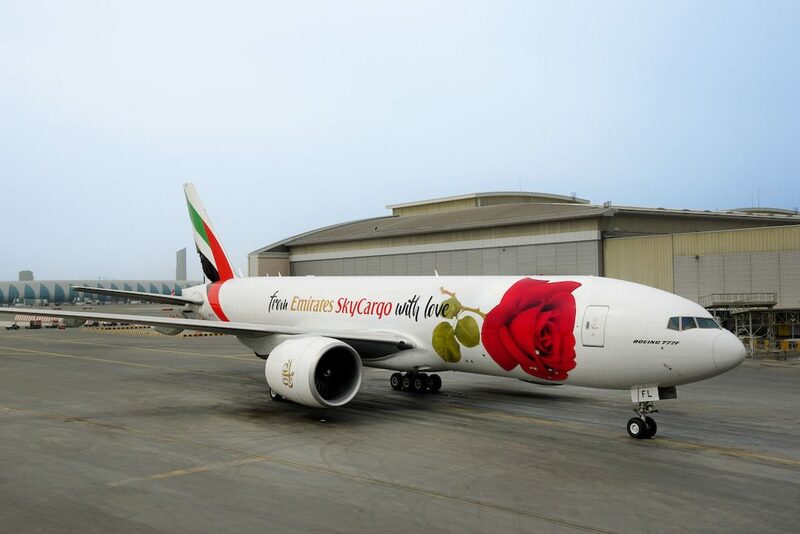 Emirates shared the story of ‘Rosie’, its aptly-named Boeing 777 SkyCargo plane, which spreads love across the world. Designed with a special rose livery, this plane really does spread love across the world. Rosie delivers fresh roses from Nairobi to Amsterdam and onwards. It’s a unique story which is valuable and followers on Twitter enjoyed it. 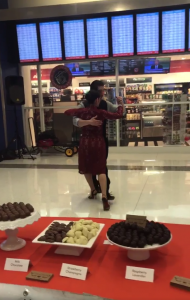 DFW spoilt passengers and visitors with chocolates, roses and tango in its busy Texas terminal. Hard to go wrong when you’re speaking to heart with food! There’s something special about Yukon’s Air North Valentine’s Day video which doesn’t take itself very seriously (in the video that is, I’m sure it does as an airline!). The airline also had chocolates for passengers. Hawaiian Airlines combined Valentines Day with its World Elite Mastercard campaign #WeLoveBeingYourCard. Passengers on two flights were surprised with long-stem roses, red and pink popcorn and 500 Hawaiian Miles. Finland’s national carrier delighted passengers on a flight between Helsinki and New York with some surprise singing by the Finnair Singers Club who were part of the cabin crew. The Finnair Singers Club is a group of Finnair employees who come together to sing outside of work hours (usually). America’s busiest airport gave away candy to travellers and created a ‘love wall’ for passengers and visitors to spread their messages of love. Vancouver kept it short and sweet. Love is complicated at Ryanair. Not their most creative but nevertheless a good brand fit. 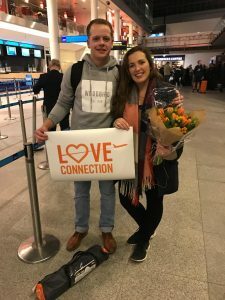 EasyJet asked people to share their stories of long distance love and brought one couple couple together for Valentine’s Day. 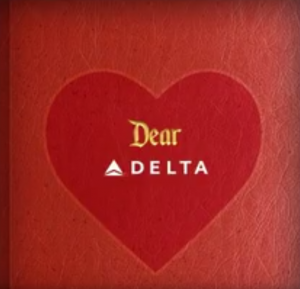 Not much from Delta this year in terms of a campaign but a classy graphic at the very least. AA let customers know they’ll take them wherever they want to be. #FelizSanValentín from the team at Aeromexico who shared this video. I really like what Virgin America did. One they teamed up with the American Heart Association to raise awareness about heart disease and getting heart-healthy. 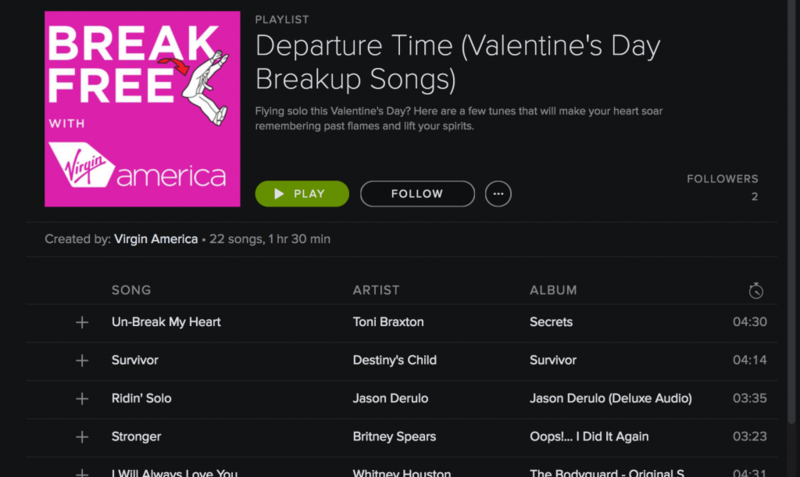 Two, they created this Spotify playlist of songs for people ‘flying solo’ on Valentine’s Day. SYD spotted two lovers on the airfield. ADL gave out chocolates and retail vouchers to customers. 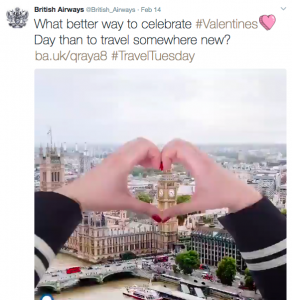 Heathrow sponsored a popular travel blogger to write about romantic gift ideas available at the airport. The LCY team gave out candy to visitors. Dubai Airports shared a very special moment between two travellers as Luke popped the question to Sarah. BA did an ultra short video of locations you’d probably love. And so did CX. Both it an BA’s are very similar. Cabin crew decorated aircraft with handmade decorations. 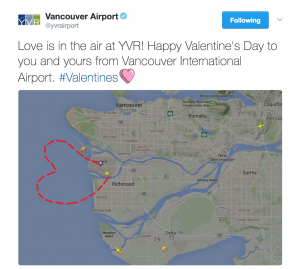 0 Comments on "The 2017 list of airport and airline Valentine’s Day marketing"